overland-underwater.com - A Charity Drive UK-NZ - Anyone For Seafood..? Written by Alex Towns. Uploaded 22 February 2007. Having hunted down an internet cafe then restocked food... oh no not steak again - it's cheaper than chicken here we were ready to head off. With only a few hours of light left, we decided to pop into the tourist office to see what was worth seeing in the area. Within about 5 minutes we had arms loaded with about 7 different maps all scribed with highlighter and points of interest circled, as we stared on bemused at the rapid fire suggestions emanating from the tourist rep. Somewhat dazed and confused we got back into Tinfish and decided as we liked the forest so much we'd do a simple drive around the Valley of the Giants. It really is a beautiful area and the majestic trees are captivating. Halfway round the loop we stopped off at the giant Tingle Tree. We'd seen some whoppers already, but this one you could easily park your car in! Next on the loop was circular pool, which made a pleasant walk so long as you adhered to the over cautious warnings... River Risk Area No, really. It does make us chuckle just how often these ludicrous warnings are plastered in the most obvious places... Cliff Risk Area at the edge of a cliff - d'oh. Makes me remember our walk along Tiger Leaping Gorge in China, when we headed down to the surging, raging, turbulent river, squeezing and bursting out between a gigantic boulder and the sheer cliff wall! If that wasn't instant death should you slip and fall in, the track that clung (and often had collapsed) to the cliff no more than a mere foot wide in parts where it'd been chisel out of the rock, was enough to make you feel giddy, weak kneed and sick. Of course there wasn't even a rail to hold little lone a single Risk warning - strange that! Being up in the forest it was easy enough to find ourselves a great bush camp where we settled down to another steak BBQ, with the million stars above providing suitable lighting for the trance music atmospherically blasting from the stereo. Camps like this have been all we've needed to unwind and enjoy the great outdoors. After a lazy morning, we swung back via Walpole to make use of the mobile reception to organise some diving in Albany and most importantly meeting up with Phil & Tess in Denmark for dinner. We then tried to decipher the many squiggles, underlines & circles on the encyclopaedia of maps we'd obtained, but admitting defeat, we simply headed off to look at some of the spectacular beaches and find a suitable spot for tonight's camp. I think this is where a 4x4 really comes into it's own on a trip like this. It allows you to go that extra mile off the tarmac and find some spectacular locations away from the crowds. On our second foray down to the coast we ventured upon Little Boat Harbour an absolutely beautiful spot, with all the necessary coastal ingredients... turquoise seas, dramatic coastal rocks, golden sand beaches, calm sheltered water and raging surf all within a single turn of the head, oh and off course the necessary Risk awareness! On an otherwise precariously rocky ground, we remarkably, almost by accident, managed to have all the relevant wheels up on suitable rocks or down in crevices, ending up with the car almost perfectly flat! That'll be camp then. It's great to sit there sipping a beer and stare out over the ocean, even more fantastic to just climb up to bed and lie listening to the orchestra of the waves lull you to sleep. With the task today to get as far as Albany so that we could prepare for tomorrows dive, we were up a little earlier and en-route stopped by some of the seaside spots more accessible to the normal tourist. From being the only car, we now had to hunt for a parking spot, although on walking down to the waters edge we could both immediately see the attraction. Most of this coastline is pretty hazardous, if not the cliffs then the rolling surf smashing onto the beaches. This spot however had a natural boundary of boulders acting as a breakwater forming an aptly named 'Green Pool' of safe water for families to spend a day at the seaside. Just around the corner is another small bay containing a herd of stone elephants and to the broader imagination quite plausible! Having to pass Denmark on our way, it seemed almost rude not to stop off at one of the many fine wineries which also adorn this region. West Cape Howe served as both a refreshment stop and a necessary lunch stop, as much to give ourselves a wee bit of time to digest the tasters, than just fill our tums. The wine was very nice and with clear skins of Pinot Noir on special we managed to squeeze a few into Tinfish. Clear Skins are becoming all the rage here, it's basically bottles of wine without an official label and may be due to over production or the like. It's a bit hit n miss, but when you can have a taster first, it makes good sense. With our action filled day continuing, we hot footed onwards to West Cape Howe itself... the most southern point of Western Australia. One thing we're noticing here is that every town, place, hill or tree has something unique or special about it that the local residents 'big up' in everyway they can. Some I must say are a little tenuous but you must give them credit for trying. With the clock running in order for us to get to the dive shop before closing, we deflated tyres and headed off along the sand dune track giving ourselves until 4pm when we must turn around. Not ones to try and fit too much in of course. We'd nearly made it, when just in front of us blocking the way ahead was a broken down antique 'Cruiser occupied by a young couple. As etiquette dictates, when in the bush you offer assistance. He had a fuel starvation problem, so the engine simply wouldn't give any power. Sucking on the fuel hose to try and prime it, it was apparent that there was some serious blockage. Eventually he decided to call his dad, whose car it was. We were a little surprised when he admitted he had a signal all this time, then watched him climb on the roof to call home on his mobile! He quickly found out there was an extra fuel pump that needed to be turned on using the demister switch! Why he'd not just done that half an hour ago, I'm not sure! It was of course gone 4pm by now, so we made a bee line for South Coast Diving Supplies only to find out on arrival that due to the current winds the visibility in the bay would be shocking and he thought the skipper would call the dive off. To prove the point, he called up the underwater webcam attached to the former HMAS Perth and showed us the real time online picture. Incredible! On the website too were all the current wind statistics piped directly from the buoy which marked the resting place of the wreck. Now why can't all wrecks have this facility provided! Sure enough the skipper concurred and for the first time in our lives the dive was cancelled due to bad underwater visibility, which we found remarkable as the policy normally adopted by dive outfits is 'you pays your money, you takes your chance!' A refreshing attitude! We re-scheduled for later in the week and took his advice on some camp spots near to town. With time now to kill and Tinfish needing an oil spa treatment we found a location down by the mariner that allowed oil to be disposed off. After the shock at Tom Price, where the mechanic could fit in an oil change (a 15min job) in a week's time for the pleasure of $250, I was resigned that I'd just have to do it myself. Long gone are the days we enjoyed in all the other countries were you'd simple rock up and before you'd even switched off the engine an oil monkey would be straight under the car and revelling in the job, all of which would cost some loose change. So decked out in my overalls, with oil pans, filters and spanners spread evenly, we attracted quite some attention. After a number of iterations to the massing public about our expedition and the continued wise cracks about the car having to drive on water to get to Aus (no just a long snorkel - ha ha) I proceeded with the oil change at a snails pace acutely aware that the sun was now setting and we still didn't have any rear lights courtesy of the Gibb River Road! One fella I left talking with Maz whilst I was making some progress got onto asking about the charity aspect of the expedition. It's always the way we steer the conversation within a matter of minutes as you're never sure who might be kind enough to make a donation and as you can see from the rising thermometer it has worked quite well in Australia so far. This guy worked on one of the moored fishing boats and although he was a bit strapped for cash, he asked if the charity would benefit from a crab and a lobster! Hmm, possibly not the charity, but I'm sure our stomachs definitely would He disappeared back to the boat then returned with a gigantic deep sea crab accompanied by a lobster. Seafood tonight then... but more importantly where the 'ell would they fit! Never having prepared such a monster before, we definitely had no pot big enough and took advice on how to BBQ them both. First course would be lobster tail and crab claws. We'd been shown on Christmas Day no less how to tail a lobster and it didn't look too complicated, you just grab hold of the body with one hand, the tail in the other (gloves help make sure you don't get jabbed by the tail spikes as it curls it's tail), give it a quick twist and hey presto the tail comes off! In practice it's a little bit tougher than that and Maz went all squeamish as I did the manly deed! The lobster didn't look too impressed either! With the claws and tail in the BBQ rack Maz almost passed out when she saw the lone tail still flicking on its own accord... well how would you like to be held over hot coals? Next the crab was inverted and allowed to cook in the juice of its own shell and was done to perfection. We had so much meat that there was plenty left over to make a crab salad for lunch the following day. With the day on our hands now to kill before meeting up with Phil and Tess in Denmark that evening, we decided to pop back into Albany for a coffee. 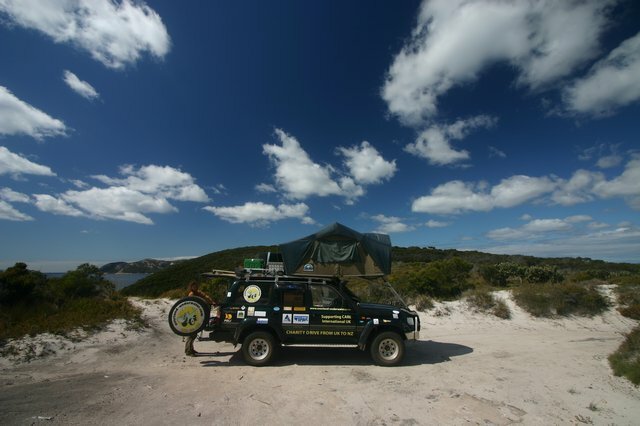 Whilst we sat on the pavement watching the world go by, making tentative plans for our remaining days travelling Australia, we were briefly interrupted by an elderly couple of English brothers who had spotted the familiar UK number plate and were really supportive of our expedition. As we were leaving they called to us again and kindly donated AUD50 to CARE, so a BIG thank you Frank and Brian. It's easy to find things to do in Denmark... visit a winery of course Today we decided to sample the delights of Mad Fish Wines and it's fair to say that we enjoyed every tipple that we sampled and I'm fairly sure we tried them all! We couldn't resist a mixed case of white, rose and red, a little treat for the road ahead. We relaxed on the grass enjoying our crab salad whilst Judith the lady who we'd been tasting with called up her boss to tell her all about our expedition. To help us on our way Mad Fish Wines very kindly presented us with a cap each, a t-shirt and a bottle of their fine Chardonnay. A delightful afternoon! Completing the tourist loop drive around Denmark we happened upon a cheese factory and couldn't resist the lure of some cheese tasting, a natural progression following wine! Not only was there a multitude of cheeses to taste, but also wafer thin slices of fudge and a selection of desert wines in all flavours. As chance would have it the fridge had just enough space for a few blocks of cheese, so deal done - yum! With our rendezvous for dinner fast approaching, we hunted out the campsite Phil and Tess were staying at and Maz turned on all her charms to get the campsite guard to lower the gate to let us through and past the 'No Visitor Vehicles Beyond this Point!' We've seen less secure prisons than most of the campsites around Australia! Dinner was at friends of Phil and Tess, so we all climbed into the car along with their two children... two enormous shaggy Afghan hounds and made our way to Darryl and Veronica's holiday cottage for a delightful evening of fine wine and great food. The guys had had somewhat of a session the night before, so by midnight all were beginning to sag, or might it have been our never ending stories of life on the road! 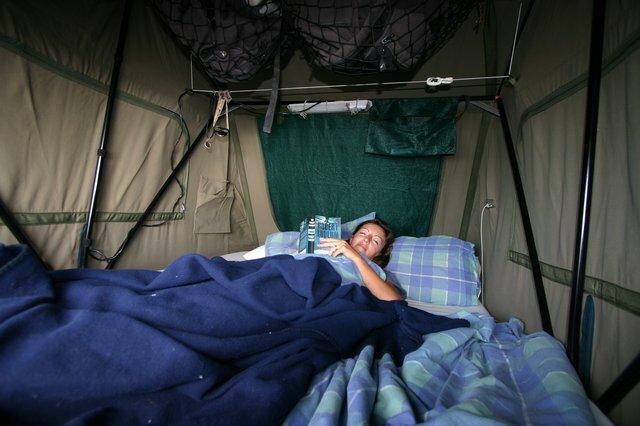 With our car safely in Fort Knox we stayed the night in the campsite, which allowed us (i.e. Maz) to catch up on some washing, although I did help by putting a dollar in the dryer. Unfortunately as we went for showers leaving the car doors all open, the heavens opened - typical. Saying our farewells to Phil and Tess, we settled down for a coffee in Denmark hoping the rain would pass over. With a slight improvement we headed back over to West Cape Howe, determined this time to get to the most southerly point (of Western Australia) and had a picnic lunch sheltering from the gale force winds. Hmmm not boding well for tomorrows dive, albeit in a very sheltered bay! To have a look first hand, we continued around the coast and followed the Frenchman Bay tourist drive to take in some of the views of Torndirrup National Park. At the end of the drive you can literally see across the back to the buoy marking the spot of HMAS Perth and sheltered though it was, there were still plenty of white horses capping the waves. On the drive back round to Albany we stopped off at some of the sights on this rustic coast line. Although a huge swell you would have thought would be ideal to set blowholes a blowing, after we clambered all the way down, apart from making a lot of noise, nothing much else was happening, so we moved on. Far more impressive was the Gap, which quite simply is a gap about 20ft wide that has been weathered into the cliff for some distance. As it is facing seawards, the swell was putting on a grand performance as it surged into the gap and hit the dead end. Even from the car park we could tell it was going to be lively as sea water fell like rain. I'm glad there was a railing to hold onto here as the wind was whipping everything up into a frenzy. Just around the corner was Natural Bridge, another rock arch cut away by the sea, but as the viewing platform was downwind we could only tolerate a few moments to avoid being soaked to the skin! We arrived at the dive shop to find we had the green light for tomorrow as the forecast was improving and apparently the current winds was just what was needed to push the dirty water out and get some nice clean water into the bay to improve the visibility - excellent. Once again, to prove the point up came the the webcam image and we all nodded in agreement, but secretly both Maz and I thought it was exactly the same picture as the one he showed us before! Being a 36m wreck, we'd decided to twin up (i.e. two cylinders each on our backs) so after we unloaded all the kit, we went about reconfiguring our equipment to allow for two cylinders - which also meant a bit of maintenance was in order too. Knowing this was going to be the coldest dive yet, we tried on some of the shop wetsuits, but inside we were craving for our drysuits, all nicely packed away at Chrissie's in Sydney. These guys adhere to the 'get up early to go diving' school so we were back reporting for duty at 07:30 after selling our soles to McD's for a breakfast muffin. After chatting with Gary, the shop owner and Carina, the coxswain, the kit was all loaded into the back of the boat and we squeezed into our wetsuits before jumping into the ute for the drive to the slipway. Carina must have lunched the boat once or twice before as she effortlessly backed the trailer down the slipway and slipped the boat off the trailer. Nothing like our Uni days of 12 divers struggling to push and pull the club boat off the back of the stubborn trailer! Although the wind had dropped a bit, there was still a fair chop, so Carina hugged the shelter of the coast all the way round to the wreck site. Now came the moment of truth... just how cold would it be! HMAS Perth was a former guided missile destroyer for the Australian Navy with a distinguished service record and as is common in Australia at the end of her service life it was prepared and scuttled specifically as a diver attraction. These artificial reefs soon attract all sorts of fish life and of course divers. Although for us hardened wreck divers, the attraction of exploring a wreck is always strong, unlike natural sinking's, in the preparation, great attention to detail is given to ensure the diver can't get caught or lost inside. To this extent all loose fittings are removed (along with all oil base contaminants for environmental reasons) and ruddy great big holes are cut all over the place so that it more resembles a climbing frame in a kids playground rather than a mystical wreck, which to us removes a lot of the fun. Nevertheless it was a pleasant enough dive, but after 50mins we were definitely feeling the cold and looking forward to a hot cuppa. Between dives the boat went in to shelter closer to shore. Unfortunately as is common with the ever fast changing weather patterns of this region, the sun was now hidden behind clouds and with the wind chasing us out, we were thankful for the hot soup to pep us up a bit. Since we explored the stern on the first dive, we went to the bow this time after initially descending head first down the funnel into the belly of the ship. On the ascent up the main mast, there are little plaques explaining some of the critters that live in the area and we also managed to find the webcam to smile and wave at. We felt the cold much more on this second dive and were looking forward to hot showers back at the shop. With the kit all washed and drying, we headed down to an Italian restaurant for lunch as we'd been told about their special lunch and drink offer and we weren't disappointed. With plenty of chores to be done as this would be the biggest town now for a few thousand km's, we busied ourselves working through the check list, the most entertaining being the car wash where we choreographed a dance, one with the foam brush, the other with the jet spray. One thing that wears you down after a while is a dirty car. Although a dust covered 4x4 might look the part, when you live out of it, every time you touch or brush against it you get dirty. Clean clothes once on stay clean for about 5-10mins on average. Giving Tinfish a blast and a scrub now and again really helps keep on top of it all, although we still manage to get filthy! With our jobs all done, we returned to pack all our dive kit away and say farewell to the folks at South Coast Diving Supplies before hitting the road. With dusk fast approaching we'd not gone far before we were on the look out for camp. We had an inkling that we'd happen upon a track that'd take us back to the coast where there was supposed to be some good bush camping. The first spot looked more like a small fishing village, so much to Maz's disapproval I followed a steep rough track up into the hills. Although there was fantastic views there was no shelter from the wind, so it was quickly vetoed with a 'told you so'. The second spot was somewhat overcrowded, but I'd spotted another track off and after a small debate, it turned out to lead to a perfect spot, views and shelter. We set up camp like the well oil machine that's been doing it for 17 months just as I noticed a suspiciously flat looking rear wheel. It can't be, not again! As is becoming a weekly drill, Tinfish was up in the air and the wheel swapped over with the spare. A burst of water over the flat tyre confirmed our worse fears, the bloody rim had split again! This was the second of the new steel wheels that we bought in Darwin to split. The first in Kalbarri we managed to exchange when we were in Perth, the company being most apologetic to our dilemma. Now with the outback calling... in fact it was the only real route open to us if we were to avoid thousands of unnecessary km's, we were down to one spare wheel left and worst of all unreliable wheels! Another example of the emotional rollercoaster which is the everyday life on the road for us! The next morning we didn't really have a choice but to return to Albany, initially just to get a mobile signal. It has been somewhat of a surprise to us how bad the network coverage is around Australia. Okay we know it's a big country, but you'd be surprised just how good the coverage has been throughout many of the developing countries we'd already travelled through. You'd except at least the main highways would have a signal, but no, it's only around towns and not all smaller towns at that! The plan was to trawl around the tyre shops and wreckers to see if they had any suitable 2nd hand genuine Toyota steel wheels, as by now we were acutely aware that these aftermarket wheels weren't butch enough for the job. Alas no luck. Talking with the manufacturer, they were confused as to why they kept failing as they are rated to 1,220kg and we were only 1,000kg per wheel. Regardless they couldn't cope. The best they could manage was to get replacements sent to Kalgoorlie then next main town on our fast paced route. At least they were keen to help. Being back in town we couldn't resist a return trip to the Italian for lunch, after all we were about to head bush again and leave all this civilisation behind. Pulling up outside Tinfish attracted the attention of a table of guys and we received another kind donation of AUD50. I told them to keep an eye out on the local news network GWN as we'd been interviewed by them for the telly that morning. On returning to the car we were met by this lovely old Scottish gentleman, Samuel Clark, who'd migrated to Australia years ago and had been waiting for us to return in order to give us a couple of delightful books on Albany and the region. We chatted to him about the car, the expedition and the charity and he asked if we were collecting money. After he rummaged about in his pockets for awhile, his hand emerged clasping 65c in change, a lovely gesture, but a pure Scot at heart. With a plan B all arranged for the wheels, we left Albany for a second time, hoping we wouldn't need more than one spare before we reached Kalgoorlie, let's hope Murphy wasn't around to follow us! im glad to see you guys have finally made it to Australia! hope you all are enjoying the adventures and good luck on the final leg of the journey. you guys have inspired me to hunt down a trusty landcruiser and drive it back from London to Karachi. being a avid 4x4 driver im quite impressed with your preperations on the car and all the mods u guys had on the cruiser. its quite a job preparing a vehicle to get all the way across the world! i first heard about this expedition from Doc mansoor in karachi, who enlightened me on the adventures you all had whilst in pakistan.hopefully when im done with my degree in london I'll enjoy the long drive home!